In June 2018, I attended WordCamp Europe in Belgrade. This is the largest European WordPress conference. After I was a speaker at WordCamp Europe in Paris, as well as some other WordCamps, I decided to take it easy this year. I’d only visit WordCamp Europe as a visitor and enjoy the city itself. But then Tammie Lister asked me if I wanted to co-lead the design table during Contributor Day. So I decided to play an active role once again during WordCamp Europe. I’m doing this on a voluntary basis, and I get often asked: why would you work for WordPress for free? What is WordPress Contributor Day? First off, it might be good to give some explanation about what contributor day is exactly. Contributor days are days linked to WordPress conventions. On days like these, the community works on WordPress’ several areas of knowledge. WordPress is open source software, this means development depends on the users themselves. When I started going to WordCamps a few years ago, I always skipped contributor day. I didn’t have the feeling I could contribute anything, as I’m not a programmer. It’s about time to debunk that myth. Contributing to WordPress is not only about writing code. Though it is the basis, I’d cautiously claim that code is getting less and less important in comparison. What use is code, when no one knows it exists anyway? Or when your security isn’t guaranteed? And what if the software isn’t intuitive nor user-friendly to most people? What if it isn’t accessible for people with disabilities like dyslexia, colour blindness, visually impaired or functional illiteracy? What if there isn’t any documentation on your software? And what if the program isn’t available in your language? Thousands of people worldwide contribute to all these aspects during contributor days. Working for WordPress for free, why would you do that? We’re all busy enough, so how do you free up the time? How much are you dependent on WordPress, when it comes to your income? 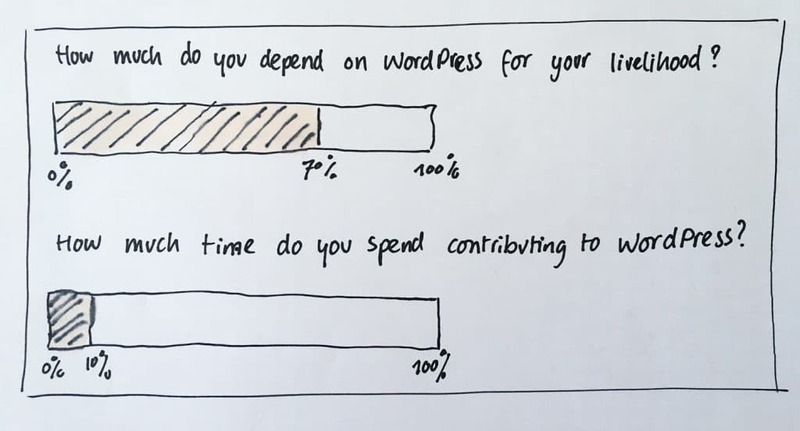 How much time do you spend contributing to WordPress? But this next question really made me think. That’s why an important reason for me is to actively be able to assert influence on the decisions and content of WordPress. How little that influence may be. But that’s not the only reason. I also learned a lot ever since I started contributing to WordPress. On the one hand by looking at how experienced people are doing things. Within the WordPress community there is much knowledge and many people want to share it. And I also get acquainted with all kinds of new programs, like Invision. I wouldn’t buy this program as a solopreneur, but as member of the WordPress design team, I can use this software. It allows me to learn how to work and cooperate with this program. You don’t only have to work for free for WordPress by working on the software during contributor day. You can help out by organising Meetups, or by applying as a speaker, volunteer or organiser. You can contribute to WordPress online on all expertises. For instance by translating from English to your native language. You can find me weekly in the international online WordPress design team. You can read what we’re doing there in this blog). And finally expanding my network is quite a valuable reason to work for WordPress for free. I got to know so many great people in those years, some of whom I even regard as friends now. It is so wonderful to meet them at the WordCamps. And it’s great to know who to call upon for certain knowledge, especially when it comes to larger projects. in the end, my customers benefit from this as well. And that might be the most important reason of all to contribute to WordPress.